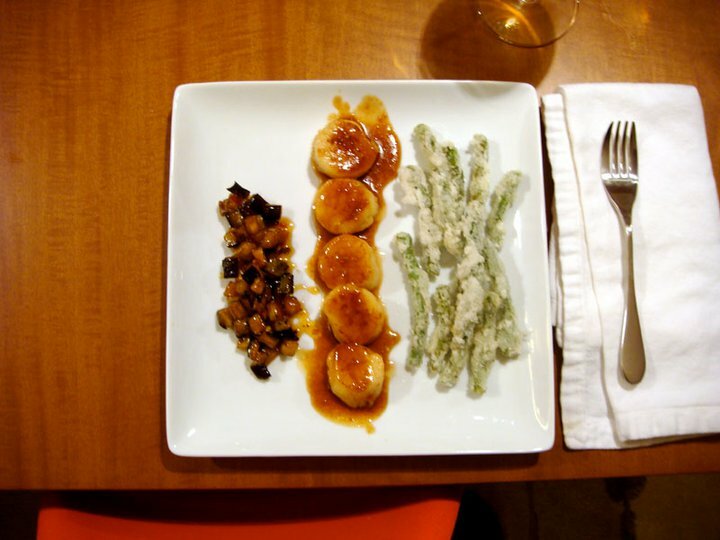 Butterscotch Miso Scallops with Crispy Long Beans and Spicy Eggplant – Top Chef All-Stars Night | Eat.Drink.Life.Love. As soon as they announced the challenge for the first episode of Top Chef All-Stars, K and I knew we were going to love this season. The chefs, all former contestants, had to reinvent the dish they were previously eliminated for. Sweet. We had a few dishes we wanted to recreate, but (very sadly) it appears Bravo is holding out many recipes for an All-Stars cookbook. Former angry guy Dale Talde was bounced for butterscotch scallops in Season 4 and, evidently, has been thinking for many years about how to improve on that so we went with his butterscotch miso scallops with crispy long beans and spicy eggplant. An hour before K got home, I marinated the scallops in some miso despite the recipe calling for them to marinate *after* they were cooked. So…what, now? Then we got prep started and I cut up eggplant and green beans while K prepared the cornstarch batter to dip the beans into. The idea was going to be to make the spicy eggplant, the butterscotch sauce and fry the beans at about the same time and, while the last batch of beans were frying, do a quick sear of the scallops. Turns out the beans take *forever* so the timing didn’t quite work out that way. K mixed a lot of cornstarch and water together and we both noted that it seemed very glue-like, but shrugged it off. Meanwhile, I heated the honey, wine and chili for the eggplant sauce (NOTE: I could not find Shao-Xing wine so I mixed equal parts rice wine vinegar and sake. Also, I have no idea what Guillen chili is so we used the bottled sweet/hot chili sauce you dip Asian food into). K charred the eggplant and we tossed them into the sauce and set aside. K started boiling the water/cornstarch mixture which got extremely thick and gloppy very quickly. Also molten hot and the next direction in the recipe is to dip the beans into it. K decided he didn’t want to burn off his fingers so we put the pot out into the freezing Minnesota winter in the hopes it would cool quickly. But I was getting hungry and impatient. So it was still hot-ish, but K took one for the team, heated up the oil and started dipping green beans into the cornstarch glue. In retrospect, it would have been wiser to use tongs because his fingers quickly became coated and sticky and he constantly had to wash his hands. There was a lot of batter that clung to each bean so we could only fry a few at a time. Consequently, the frying of the beans took FOREVER. At one point, I was dipping and coating while K was frying and my stomach was growling. When I thought the end was in sight, I heated up a big pan and seared the scallops. Except because the pan was so big the heat didn’t distribute evenly and a few of the scallops seared while the others just kind of warmed through. You only get one chance with scallops so I was unhappy with my decision. I cranked the heat and seared the opposite side the best I could and set the scallops aside, covered in foil to keep them warm (and hoping they wouldn’t overcook in their own heat). K was still frying beans. I deglazed the pan with scotch, added a little sugar and miso and, while the sauce thickened, K was still frying beans. Finally all the beans were fried and generously salted. We re-warmed the pan of eggplant and K assembled the plates . Mercifully, the scallops weren’t rubbery, but were a little sweet with a little bit of scotch bite. The eggplant was good and sufficiently spicy. The beans were good, but not as good as the amount of effort led us to believe. Without the salt, they would have been very bland, but we couldn’t complain because hey…who doesn’t like fried green beans, right? This butterscotch with scallops worked, but I’d probably choose other sauces and other preparations that would be better. Fried beans, good. But gluey cornstarch lava on every countertop, bowl, pan and floor in sight? Not worth the effort. Unless you’re making papier-mache. It would be great for that.